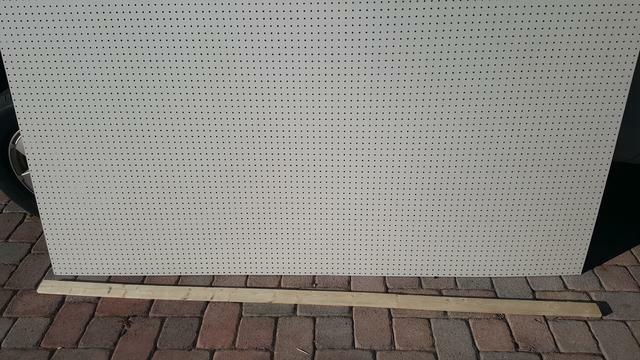 Good candidate for peg board project. 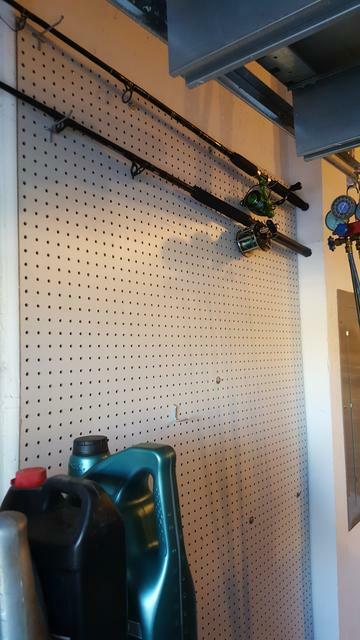 I am currently running 2 peg boards. Those do not look that great when loaded in junk but are affordable and can hold tons of stuff. Last edited by WJ-Polish Guy; 21st October 2018 at 04:35 PM. Those boards require backframe for installation. Frame design depend on intended carrying capacity for the board. In my case I am not intending for the board to carry particularly heavy objects like power tools. Therefore 3/4 thick planks will do. Wall is made of concrete blocks . I am using Tapcon brand concrete screws to attach framed board to the wall. I like to use them a lot. Box of screws comes with specific concrete drill bit. Hammer drill is a must for those. Overall easy and cheap project. I buy pegs on fleabay cheap in bulk btw. Tools I used are power saw, hammer drill and power driver. Last edited by WJ-Polish Guy; 21st October 2018 at 05:13 PM. Thread is 15 minutes on the board and alredy marked "Terrible" by the usual suspect. 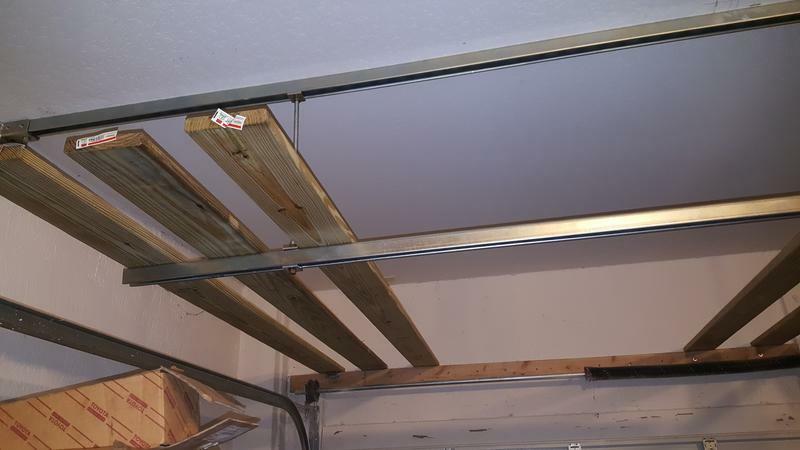 I am eyeballing large dead space above garage door for storage use. This picture shows the space with door fully open. 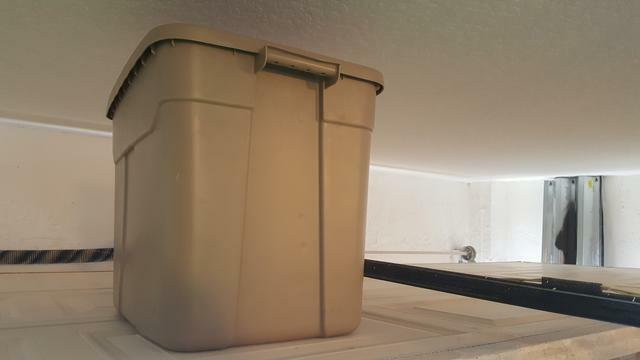 There is enough space to fit tall storage bin. I am thinking to make bin rack or rather two one on each side of chain oppening mechanism (visible in the center). There are commercial options avaliable but after review I think I can do better and cost effective. Got the material for over the door storage rack last week. Gotta love and hate those megastores. Wasted lots of time as usual there but finaly got what I need. Started today with back rail that is screwed directly to the concrete lintel beam. Next job is to screw strut channel to the ceiling perpendicularly to joists. 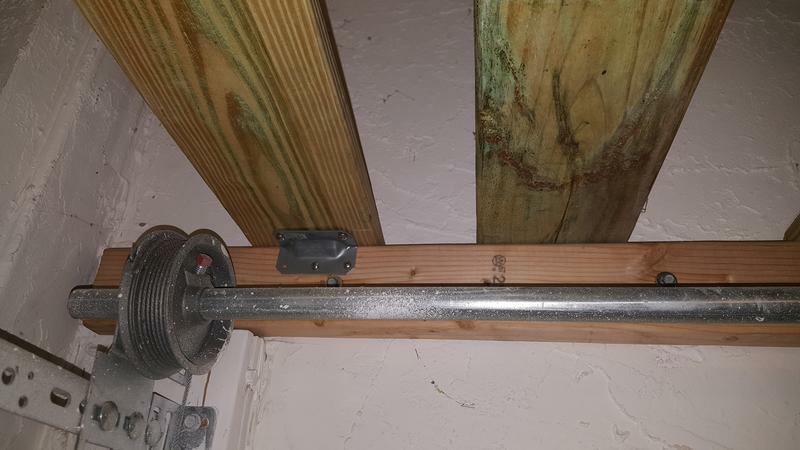 Walls of my garage are of concrete blocks, to take advantage of it I am adapting strut channel post base to get hard mounting point. Shown drilled for 3 concrete screws. 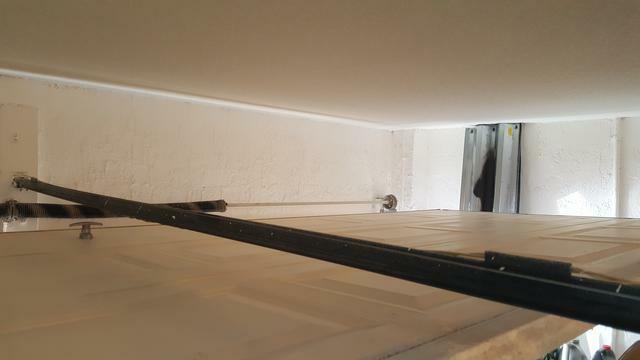 First strut channel tacked to the ceiling. 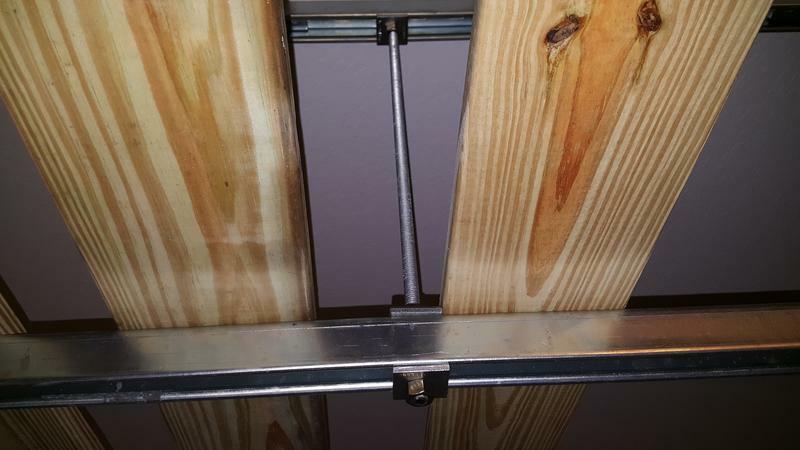 Next thing is to drop allthread rod from rafter and catch strut channel midspan. Mobilised to finish storage rack project. Pita cuz garage gate needs to be closed for overhead access and is hot and sweaty inside. Dropped allthread from the ceiling unistrut and hanged second trimmed unistrut below. Anchoring planks at the wall end to prevent shifting. Lunch and supply run to the hardware store next as I have to patch up ceiling access hole I made. Last edited by WJ-Polish Guy; 3rd January 2019 at 05:23 PM. 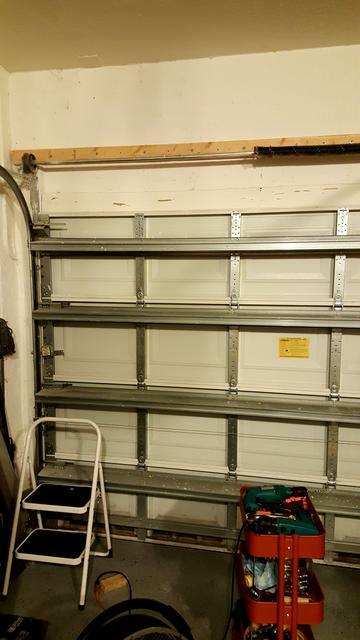 Re: Garage Storage Improvement Project. 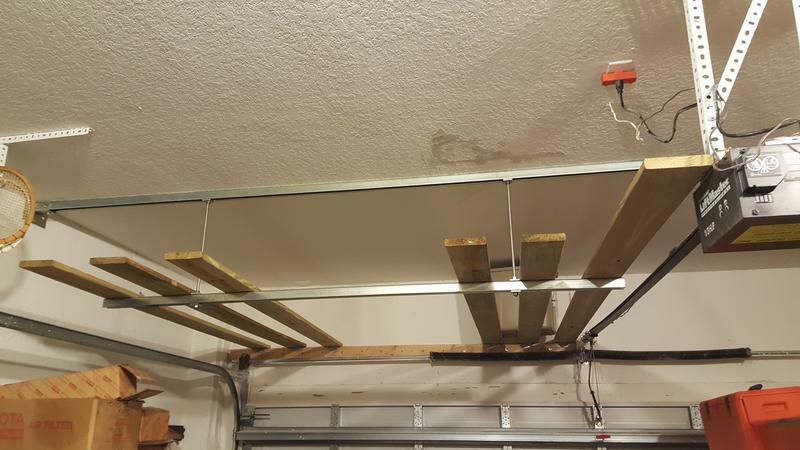 Ceiling rack. All done. Happy the thing is complete. Busy cleaning, organizing and loading up the stuff on ceiling rack. Works well so far . 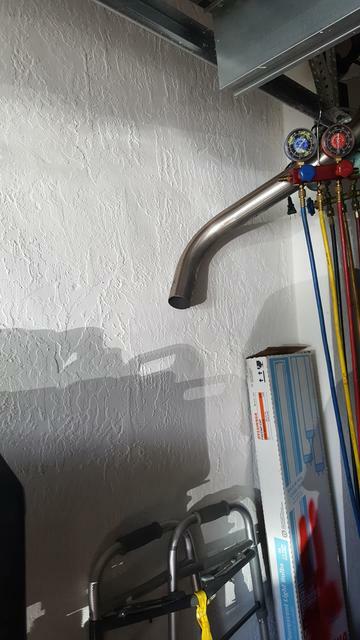 Might repeat it on the other half of the garage.